One of my enduring memories of Goa is the underrated ‘fish curry rice’ which anyone who has been there will recognize immediately. It’s a kind of bastardised Portuguese piri-piri type thing, with a deep red colour, and a tangy, sour tamarind sauce, served simply on fluffy white rice and using fish straight from the local sea; kingfish I think, mostly (although I will bow to anyone’s greater knowledge if I’m wrong about that). But it’s just a simple bowl of fresh, spicy heaven. Somehow the heat and the colour seem to be exactly representative of the fire and warmth of Goa itself, and it’s hard to find anything like it created for the British palate – which seems odd, given the volumes of people traveling to Goa and Kerala every year. I recently found a restaurant in Dorset, of all places, who boldly claimed to be able to try and match anything you’d eaten in Southern India if you wanted to go off-piste with the menu and I asked for something like the Goan fish curry. Actually, although they didn’t have the right fish, they came bloody close, so well done Chutneys in Shaftesbury. But it’s given me a hankerin’. Typical of Goan curries, this is hot and spicy with a sour tang from tamarind, and it has thin gravy. I love the heat. It’s just so beautiful. 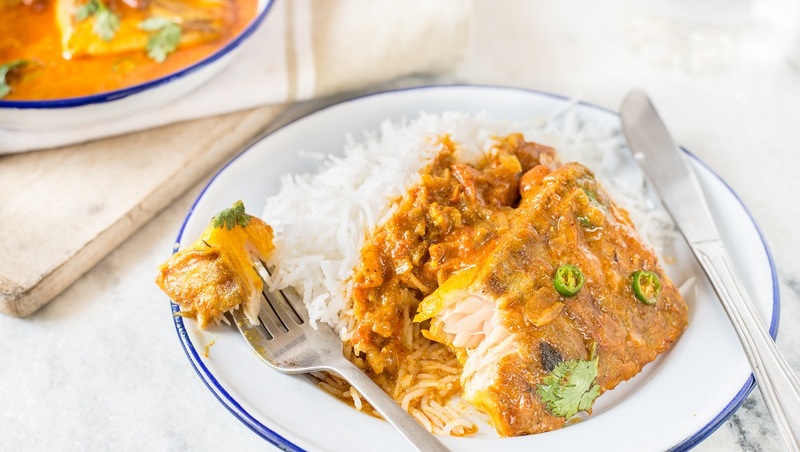 Here I’ve pan-fried the sea bass fillet for a stylish, restaurant-style presentation, but if you want to turn this into a sharing curry to put in the centre of the table, cut the fish into bite-sized pieces and gently simmer them in the gravy until the flesh flakes easily. This quantity will then serve four to six people, and all you need with it is a bowl of basmati rice to complete the meal. Cod and pollack are other suitable fish to use, but they should simmer for just a bit longer. Assemble all the ingredients and equipment before you begin. You need a spice grinder, 2 sauté or frying pans, one of which is large and non-stick, and a baking tray. First make the spice powder. Put the dried red chillis, coriander and cumin seeds and turmeric in the spice grinder, and grind until a fine powder forms. Set aside. Heat 2 tablespoons of the vegetable oil over a medium-high heat in the sauté pan that isn’t non-stick. Add the spice powder and stir for 30 seconds to cook the spices. Watch closely so they do not burn. Add the onion paste and stir for a further 30 seconds. Lower the heat to medium, add the tomatoes and continue stirring to break down the large chunks. Stir in the coconut milk, tamarind liquid and water. Slit the green chilli lengthways, then add it to the pan. Season with salt and bring the liquid to the boil, then lower the heat and leave to simmer, uncovered and stirring occasionally, while you cook the fish. You want the gravy to have a consistency like single cream. Meanwhile, rinse a few coriander sprigs for the garnish and set aside. Pat the fish fillets dry and cut each fillet in half crossways. Use a thin knife to lightly score the skin side of each fillet. Season with salt on the flesh side. Heat just enough vegetable oil to cover the surface of the non-stick pan over a medium-high heat. Add the fillets, skin side down, and fry for 3–4 minutes until the skin is browned and crisp. Gently flip the fillets over and continue frying until the flesh is opaque and cooked through. Take care not to over-cook the fillets. Adjust the seasoning of the gravy with salt, if necessary. Divide the gravy among 4 deep soup plates or bowls and top each with 2 pieces of sea bass. Garnish with the coriander sprigs. Lightly scoring the skin on the fillets helps them cook quicker and crisps the skin. This isn’t just because I have my eye on the clock with these recipes, but because gentle, quick cooking guarantees tender, delicious results. 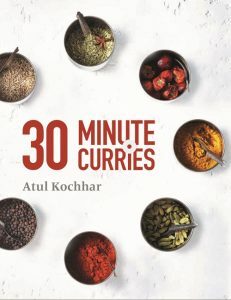 Recipe taken from 30 Minute Curries by Atul Kochhar, (Absolute Press £26) out now.